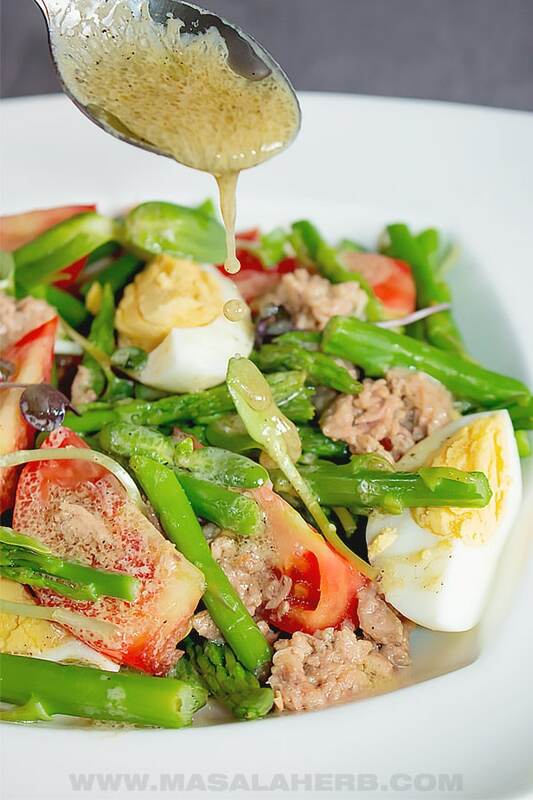 Take advantage of the Asparagus season with a cold tuna asparagus salad, microgreens and lemon vinaigrette dressing. Enjoy this spring and summer time salad as a low carb lunch meal or as a side dish with other dishes. 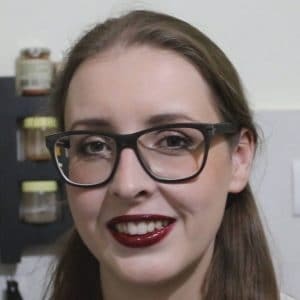 How to cook asparagus for salad? To prepare Green Asparagus, you will need to trim off the fibrouse ends first. To prepare white asparagus, you need to trim the ends as well and peel the fresh white asparagus spears. I found that when cooking green asparagus for a salad, that blanching the fresh green asparagus spears is the way to go. Blanching means that the green or white spears are cooked for about 1-3 minutes (depending on the thickness) in boiling hot water. To stop the cooking process immediately the spears are placed into an ice bath. That way the asparagus retains its crunchiness, nutritious values, and its bright green color for the blanched asparagus salad. I’m just goingt to explain quickly why I combined the following ingredients in this cold asparagus salad recipe. I used green fresh and young Asparagus. You can use white ones as well but look out for smaller younger white Asparagus because they need to blanch cook. Thick Asparagus tend to take longer to blanch and they can be more fibrouse as well. Pick Asparagus where the head ferns are tight together and not open. This is a sign that the Asparagus is fresh. Asparagus Season is from March to June. 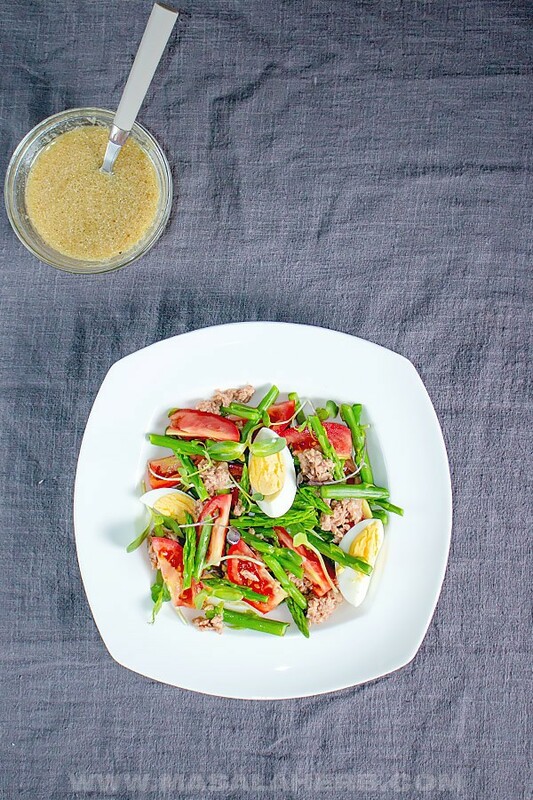 Tuna flakes add flavors and nutrition to your asparagus tuna salad. I like to use tuna in brine or spring water because I already have oil in my dressing. 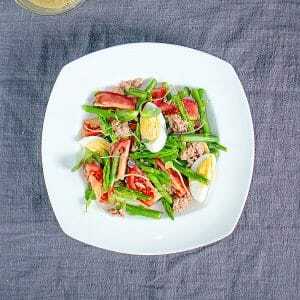 The red veggie ads flavor and texture to the tuna asparagus tomato salad. That way your salad isn’t boring. You can use regular tomatoes, cocktail tomatoes or even other coloreful varieties such as orange or black tomatoes. Those add a nice contrast to your salad. I’m going to keep Microgreens as an option in this salad. You can add it if you can grow your own or buy them. Microgreens grow from seeds such as radish, peas, collard, kohlrabi, broccoli beets, and mustard to just name a few. Microgreens are the first shoots and leaves of a plant. In the German-speaking countries, we grow Garden cress microgreens, which is super popular there. The fragile plants add a lot of flavors and nutritious elements to your asparagus microgreen salad. You can add a mixture of microgreens to your salad if you like. I like to add radish, beet, pea and gardencress microgreens because of the flavor profile. Microgreens are still very new so you might not have encountered them yet. However, I think they will be part of the next health food weave! If you can’t grow or get microgreens, leave them out OR substitute with sprouted beans (which are more common). 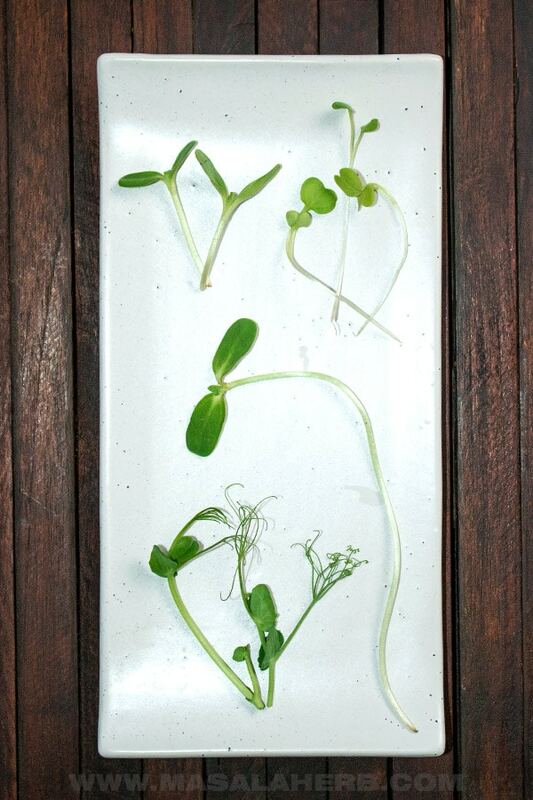 You can grow your own microgreens from seeds easily at home with a Seed Sprouter Tray and a Microgreens Seeds Kit. I LOVE adding a boiled egg to my salad. I’m kind of an egg person and besides the boiled egg compliments the tuna, tomato, asparagus and microgreens. I wanted to keep the dressing light for this salad, so I chose a french lemon vinaigrette dressing. The dressing includes fresh lemon juice, olive oil, classic Dijon mustard, sald and pepper. Flavorful low carb tuna asparagus salad with microgreens and a lemon vinaigrette dressing. Bring some water to boil and place your eggs into the boiling water. Boil for about 6-8 minutes covered or until hard boiled with a yellow yolk in the center. Take through cold water once boiled to stop the cooking process instantly. Peel and keep aside. Rinse your fresh ingredients and keep the quartered tomato and microgreens ready at the side. Trim the fibrous ends off your asparagus. If you use white asparagus, peel as well. Chopp your asparagus into 2 inch long pieces. Keep a pot to boil with water and place your asparagus into the water for about 1-3 minutes. 1 minute for young and thin Asparagus and 3 for very thick spears. The Asparagus will get blanched, which means it will just cook enough to remain crunchy. Keep a bowl with ice water ready and place your blanched asparagus into the ice water to stop the cooking process. Assemble all the salad ingredients, including asparagus, tomato, boiled egg, tuna chunks, and the microgreens and keep in the fridge to cool a bit. Prepare your vinaigrette dressing by mixing together the vinegar, salt and pepper, and dijon mustard. Then add the olive oil and mix or shake into a smooth dressing. Pour the dressing just before serving time over the salad. Microgreens are optional. You can add a mixture of microgreens if you like. They add flavor and microgreens are healthy nutritious. Over boiling of eggs can turn the yolk dark in color. Nothing wrong with that but you want a yellow hard boiled yolk for aesthetics. For the dressing, we mix first the vinegar with the salt and pepper and dijon mustard and then only we add the oil because the seasoning doesn’t mix well with oil. Keep in the fridge for a cold asparagus salad. 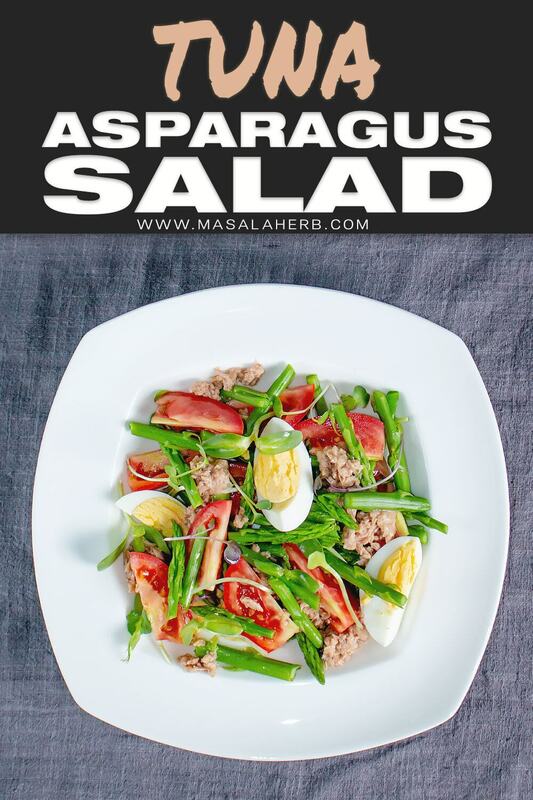 Dear Reader, did you try the Tuna Asparagus Salad? Hi, this may be interesting you: Tuna Asparagus Salad with Microgreens Recipe!